Ex-BBnaija housemate, TBoss has come to fellow housemate, Thin Tall Tony’s rescue after he was called broke for being a Taxi driver. The reality show star who stated that there is a story behind her colleague showing up as taxi driver, added that those insinuating that the 2018 housemates of the Big Brother Naija Reality show, needs to check themselves. 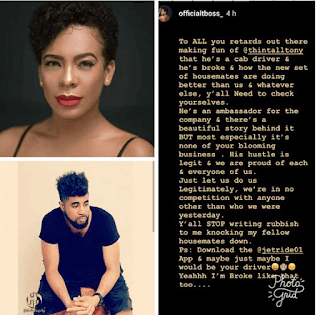 TBoss who defended Thin Tall Tony for showing up as a taxi driver, stated that he is an ambassador of the company and his hustle is legit. The news broke out yesterday when a lady tweeted that she discovered he was the driver of the cab she ordered for.